Here is a charming image of a Salem house long gone, preserved first in paint by one of its occupants, Mary Jane Derby, and later in print: the Pickman-Derby-Brookhouse-Waters House, built in 1764, redesigned for Salem’s merchant prince Elias Hasket Derby by Samuel McIntire in the 1790s. and torn down in 1915 to make way for the imposing Masonic Temple. 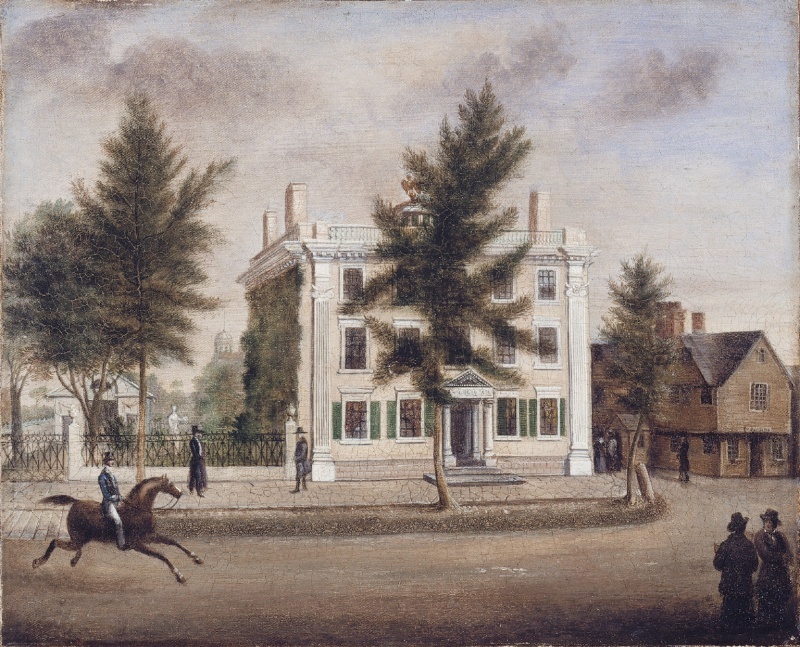 The original painting, dated 1825 and in the collection of the Detroit Institute of Art, shows not only a lost building but a lost world: this is Washington Street, one of Salem’s main streets, now lined with multi-storied buildings, shops, City Hall, and cars, cars, cars. Back in 1825, not only do we see the beautiful Derby Mansion and the adjacent first-period Lewis Hunt House (demolished in 1863), but also trees, gardens, and a cantering horse. Miss Derby’s view might be a bit romantic, but it is nevertheless engaging, and the architectural detail (McIntire’s pilasters, balustrade and cupola) is there. 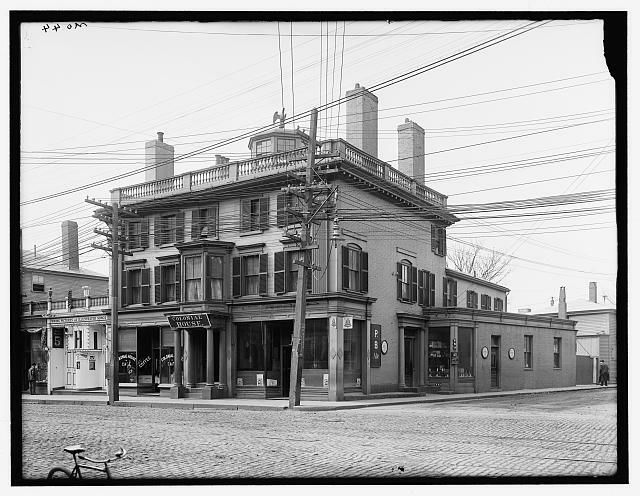 Here is a Frank Cousins photograph of the mansion later in the nineteenth century: still looking good despite its Victorian paint job, entry bay window, and rear addition, but beginning to get crowded out. I’d love to know more about that big white statue in both the painting and the photograph: couldn’t turn up a thing. Mary Jane Derby (1807-1892), granddaughter of Elias Hasket Derby, is generally labelled an “amateur” artist, but at the same time as she was assembling an album of Salem images for friends and family she was working with the pioneering Pendleton Lithography firm of Boston to reproduce her paintings as lithographs, including that of the Derby Mansion. Her artistic career ended with her marriage to the Unitarian pastor Ephraim Peabody, but they seem to have had a happy and productive life together, as recounted in A New England Romance: the Story of Ephraim and Mary Jane Peabody (1920), the collective memoir written by their sons Robert (founder of the Boston architectural firm Peabody & Stearns) and Francis. The story of the mansion can be gleaned by its last photograph, published by the Detroit Publishing Company about 5 years before its demolition. 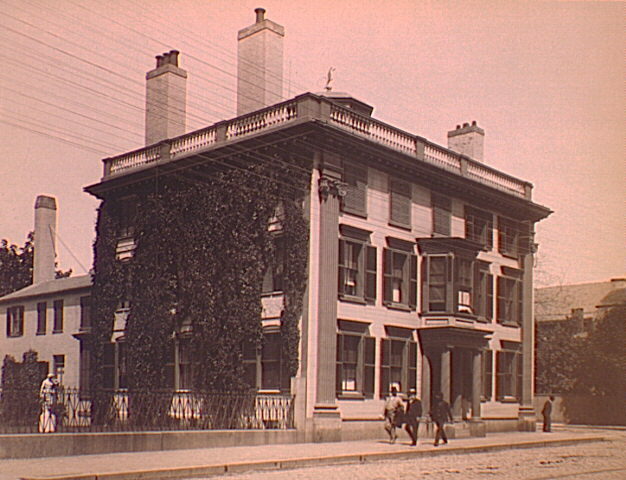 It is no longer the Derby Mansion, but “Colonial House”, having lost its first-floor reception rooms, garden, and stables to urban development. It’s on a busy block, caught in a web of wires, and on its way out. This entry was posted on Tuesday, October 11th, 2011 at 7:21 am	and tagged with Architecture, Art, First Period, Photography, Samuel McIntire and posted in History, Salem. You can follow any responses to this entry through the RSS 2.0 feed. This is a really important photo; to the left of the building in one of Salem’s short lived , store front, movie houses. It was only in business a few short years, but due to the slow film Cousins’ used & the high DPI of the scan, you can really zero in on the theater. Photo’s can be data-mined too ! Information & photos of these early theaters is scarce and in demand. This is SO cool although I’m sorry it’s gone. I’d love to be able to see what it looks like today. I only ever knew this house before through the Cousins photograph, and have always been intrigued. The watercolor is just marvelous. I would swear that the cupola used to be in the Essex Institute garden, with a fresco by Corne? I’m on the hunt for the cupola—will check back! Pieces of this house are everywhere; one needs to be a real house detective. aargh, I accidentally hit the ‘enter’ key before I was finished. Love this post—and as always, rapidity of change, as documented here amazes me.